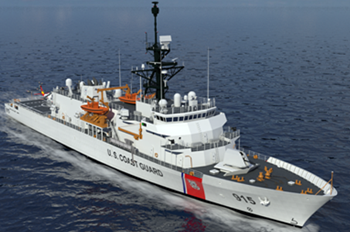 This entry was posted in hybrid propulsion, Offshore Patrol Cutter, propulsion, Shipbuilding by Chuck Hill. Bookmark the permalink. As you discovered that the DRS motors to be installed on the OPC are rated at 625HP and will be downrated to 450HP and not the 2,000 HP (1.5 MW) electric motors developed for backfitting to the AB FLT IIA. Disappointing but in line with keeping Eastern Shipbuilding ‘seaframe’ cost as low as possible at $264 million in line with Commandant Adm. Paul Zukunft’s policy on affordability.